I came across this blog post that did analysis of the most popular times and days to post on Reddit, and had the idea to try it myself for SO. 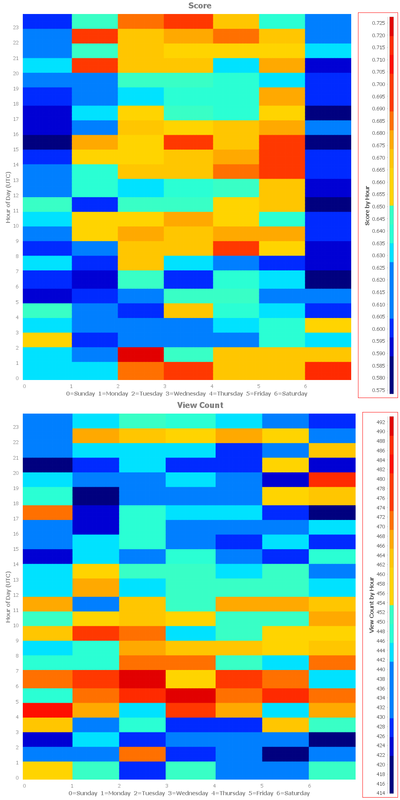 I parsed roughly 2 years worth of XML data from the archive, grouped the data by time and day of posting, found the averages for the scores and views for each time, and graphed the results using Incanter as a heat-map. Please excuse the x-axis labeling. It's proving abnormally difficult to fix. 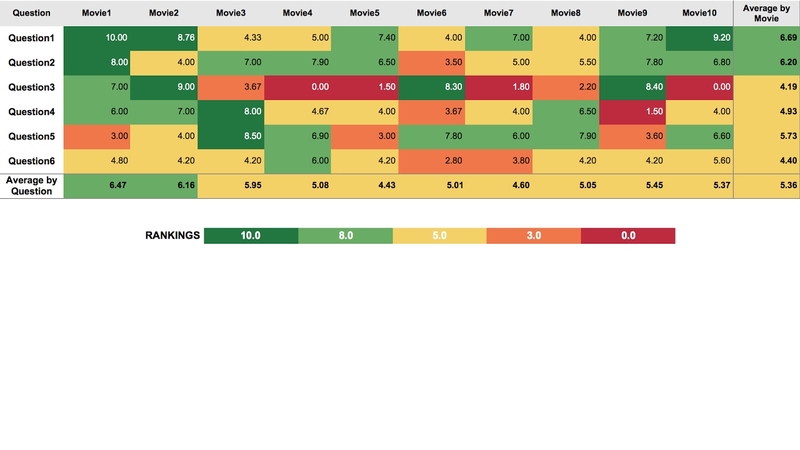 The score chart is somewhat opposite of the Reddit results. Reddit posts have more success when posted on the weekends, whereas SO posts seem to do much worse on the weekends. 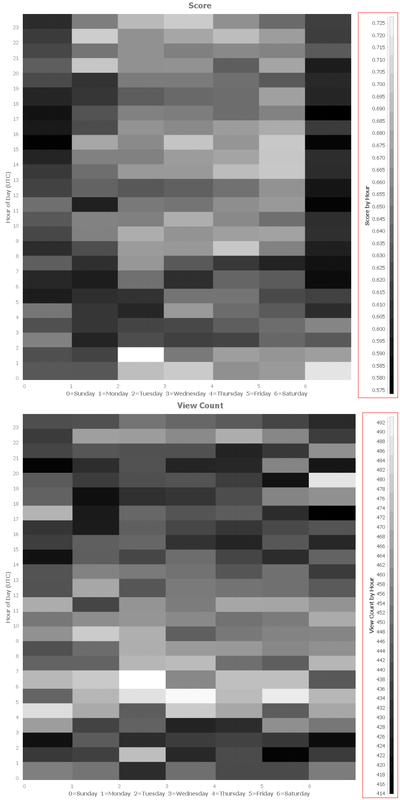 Views however seem to depend more on time of day than on the day of the week. ... which means the views to a question don't necessarily correlate with the score of the question. View counts are not adjusted for question age. The post hour is the result of rounding. 15:29 would become 15:00, while 15:30 would become 16:00. The data is, as mentioned above, supplied by Stack Exchange's archive of dumped data, which indicates the state of the site as of roughly 2018-12-02 04:52:10.250 (the time of the last included post). Obviously, this information isn't quite as useful as it is on Reddit unless you're really willing to withhold asking until a particular time. I still thought that it was interesting though. with a PostTypeId of 1 (questions). posted on or after 2016/01/01 00:00:00, and up to the date of the data dump (2018/12/02). I figured data more than a few years old is less relevant to now. that wasn't deleted, since I don't have access that information. Browse other questions tagged discussion voting views .